If you're thinking about a family trip to Disney World, most people will agree that you can't go wrong at any age. 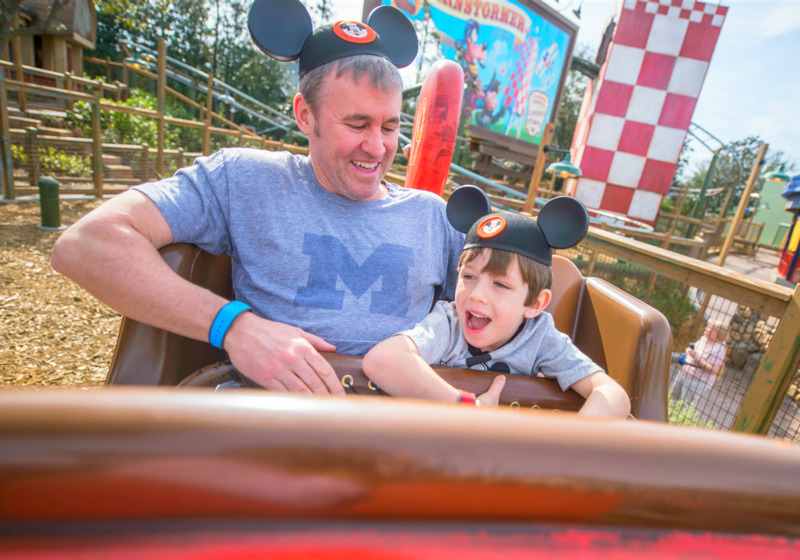 Don't worry that your child is too young or too old, because people of all ages, from toddlers to seniors, get great satisfaction from a trip to the Disney theme parks. Tickets for a family of four with multiple days planned for multiple parks can be a small fortune—it adds up quickly. So if you want to find the perfect age and do not think you will be able to make a return visit, just go when you can afford to go. And, keep an eye out for deals. Parents often stress about when to introduce their kids to Disney World, but there is no perfect age. The perfect age is simply whenever you can make it happen. Certainly, one year does not make much difference in your child's experience, and there is a lot to be said for taking your children at an age when they can remember the experience and also meet the height requirement for all the rides and attractions. Just like Peter Pan is the boy who can never grow up, Disney World has the power to transform grown senior citizens into playful, youthful fun seekers. Don't worry about your child feeling too old for Disney World. Tweens and teens love going to Disney World. They may no longer be interested in riding old favorites such as Dumbo the Flying Elephant and the Mad Tea Party, but that just leaves more time for the many cool attractions aimed at older kids. If you are traveling with teens or older children, then the type of tickets you buy and the types of theme parks you visit is influenced by the children in your group. The same can be said for preschool-aged children. If you are thinking of selecting a two-day Magic Your Way ticket without the park hopper, visit the Magic Kingdom on the first day and a different park on the second day. While the Magic Kingdom has many wonderful attractions for all ages, the Fantasyland is almost entirely aimed at preschoolers and younger kids. After researching the Magic Kingdom attractions, you may find that almost everything an older child would want to see can be covered in a day. Older children may even love the other parks as much or even more than the Magic Kingdom. Most older kids' favorite attractions at Epcot include Mission: SPACE, Soarin' Around the World, and Test Track as well as the food and entertainment at the World Showcase. Older children can appreciate the Animal Kingdom for rides such as Avatar Flight of Passage, Expedition Everest—Legend of the Forbidden Mountain, and Kali River Rapids. At Hollywood Studios, older kids usually make a beeline for The Twilight Zone Tower of Terror and the Rock 'n' Roller Coaster. It's a good idea to incorporate your child in planning your itinerary. Ask your older child to help you research the other parks and maybe even let your child help you decide which parks to visit. At twice the size of Manhattan, Disney World is a vast place comprising four theme parks, two water parks, more than two dozen resorts, and an entertainment and shopping district. You're not going to be able to do and see everything in a few days, but if you research wisely, you will be able to prioritize your must-do experiences and have a fabulous vacation with no regrets. Before your trip, be sure to spend some time getting to know MyMagic+, which is the innovative planning system Disney developed to make it easy to guarantee ride times with FastPass+, make dining reservations, find out about entertainment and events, and customize your experience exactly the way you want it. You can consult a number of guides to Disney World to find a handful of timesaving and potentially cost-saving tips. If this is your first time visiting Disney—or even if it's been decades since your last visit due to big changes to lines and getting around the parks—you should consider getting a travel agent. It doesn't cost anything extra to book your trip through a Disney travel specialist. And booking through a specialist gives you access to someone who can help you pick the perfect hotel, plan your itinerary, secure dining reservations, obtain tickets to shows and attractions, and even help you make the most out of FastPass+. Timing is everything. Disney World ticket prices fluctuate with demand, with higher prices during the peak season and lower prices during slow seasons. In addition, hotel rates rise and fall throughout the year as do crowds and temperatures. The best times to visit Disney World are when the rates, crowds, and weather are tolerable at the same time.